It’s National Fertility Awareness Week and today the campaign group Fertility Fairness has released an audit which has found new restrictions on IVF funding. The survey covered all the Clinical Commissioning Groups (CCGs) in England and found that 80% are failing to follow the NICE guidance which says that all eligible couples under the age of 39 should be offered 3 full cycles of IVF treatment. Many are also setting new criteria to limit eligibility for treatment. Despite the fact that neither male age nor weight affect the success rate of IVF, more than a quarter of CCGs have decided to use the male partner’s body mass index (BMI) to decide whether a couple can access NHS treatment, and 8% no longer offer NHS funding if the male partner is 55 or over. Around one in four CCGs also use AMH or antral-follicle count to check a women’s ovarian reserve (an estimate of the number of eggs in the ovaries) to decide whether she is eligible for IVF. The NICE guidance gives some guidance on levels at which these may be helpful to assess how a woman may respond to the drugs used in IVF to stimulate the ovaries, but there is no suggestion at all that this might be used to decide who should be eligible for treatment. 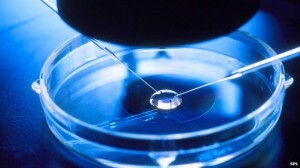 23% offer two IVF cycles. 13% offer three IVF cycles. In the last two years, 30 CCGs have reduced NHS fertility services, and one in ten CCGs is currently consulting on cutting or removing NHS fertility treatment. This entry was posted in National Fertility Awareness Week and tagged Aileen Feeney, AMH and IVF, Antral-follicle count and IVF, BMI and IVF, British Fertility Society, CCG criteria for access to IVF, fertility fairness, Fertility Network UK, infertility, IVF, IVF rationing, National Fertility Awareness Week, Raj Mathur, Sarah Norcross, Scream4ivf, weight and IVF by fertilitymatters. Bookmark the permalink.